Palin says Emanuel should be fired over a recently reported comment. (CNN) - This time, White House Chief of Staff Rahm Emanuel has gone too far, Sarah Palin says. The former Alaska governor is calling on President Obama to fire his notoriously coarse top aide after a report in the Wall Street Journal last week quoted Emanuel as referring to liberal groups in August who attacked the president's health care plan as "F-ing retarded." In a posting on Facebook, Palin says the language is not only "caustic [and] crude" but deeply offensive to those with disabilities. She also compares the choice of words to that of the "N-word" in reference to African-Americans. "His recent tirade against participants in a strategy session was such a strong slap in many American faces that our president is doing himself a disservice by seeming to condone Rahm's recent sick and offensive tactic," Palin wrote. "Just as we'd be appalled if any public figure of Rahm's stature ever used the "N-word" or other such inappropriate language, Rahm's slur on all God's children with cognitive and developmental disabilities – and the people who love them – is unacceptable, and it's heartbreaking," Palin also wrote in the post Monday evening. Palin's youngest child, Trig, was born with Down Syndrome in April, 2008. Special Olympics Chairman Tim Shriver has also taken issue with the language, sending a letter to Emanuel last week asking him to join his organization's campaign to end the use of the word. The White House has not commented on Emanuel's reported language. Though I generally loathe anything that falls out of this wretched woman's mouth, I have to agree with her sentiments about the use of the word retarded. It is a hurtful and hateful word in its current usage, which, unfortunately remains accepted and rampant among children, teens, and even the most sophisticated of adults as evidence by Emanuel's recent use. This is a hard and personal issue for me, as I too have a close loved one with several disabilities, and though I do think we need to set a good example with repercussions, I don't know if he should be removed. For sure, though, some punishment should be enforced and a more open dialogue needs to take place over the rampant and unfortunate use of retard and retarded. The end justifies the means....!!! That's how we work in the White House at the moment. 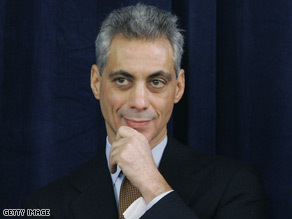 Rahm Emanuel should be fired. Gotta give this one to Palin...She's right! Emanuel should be booted for that comment. And I thought liberals were the only knee-jerk, political-correctness advocates. Apparently Republicans are afflicted with the disease, too, when it's to their political advantage. Retarded means "slow or limited in intellectual or emotional development or academic progress." Because those are the same charges that Palin threw at liberals during her run for the vice presidency, her suggestion that Emanuel cannot level those charges is hypocrisy. Maybe she should fire herself! Palin calling anyone "caustic and crude" is laughable...like the pot calling the kettle black! maybe his choice of words was blunt and to the point. But like it or not there's many like myself, that agree with the jest of what he said. She is disgusting hypocrite. Empty head. If I call someone "retard" its because they are acting in such a way that the word "retard" best describes tham as acting. Drop the drama Sarah. No one cares! Poor old Sarah has clearly never been to Chicago, where F-bombs and colorful language are as common place as moose are in Wasilla. Grow up Sarah. What ever happened to the 1st amendment? Oh, that's right, she and the Neo-conservatives now determine what is acceptable under the 1st amendment. Gee, I never pegged Palin as PC. Sick and offensive tactics... such as spreading fear about "death panels"? Now THAT'S F-ed up. Emmanuel is there because he and Obama are very much alike. Why do you think he hired him? We can't get rid of these people for 3 yrs and believe me we will in 2012. Unless they get caught slipping up. The "profane" Whitehouse is well known already. Palim may says whate ever she wants I guess this is a free country but I think the best thing Palim must do is putting his house in order. She is making millions using racism as a tool to be in TV every day she lacks talent but some idiots with not education fallow her do not forget that moron Joe the plumber that never was a plumber and Mc Cain use him as a tool to win the election. President Obama never is going to fire any body in his government because Palim or others want it, he wont the election with the mayority of the vote and he is the one who decide. I have the feeling that most Republican do not want to take their time and wait untill the next election it is only three years to go and the American will decide. She already had millions of dollars playing the race card I hope she and her family moved out of the small village and take some courses in a good College and learn History and Politic. Sarah should go get bent. George HW Bush was also offended for the same reason. She needs to get over herself. Narcissim is not a good trait. Well he is right about the condition liberals have. It is funny how PC the Republicans have gotten over the past year. Used to be they could say anything and it was a-ok because "the only people who would be offended are those Liberals and they're so PC and take things too seriously." So, Palin – since you posted this on Facebook, should Obama consider this before or after the Farmville hits you sent him? For Sarah Palin to compare people with learning disabilities or downs syndron with a people that suffered at the hands of others for 400 years is an insult. However, I understand the point that she is where she is with lies and hyperbole in her repertoire. It took me a while to figure out what was going on... she is not upset at his use of the swear word f**king, but at his use of the word retarded to describe someone who is not very smart. Okay, I understand her sensitivity, but what should we call someone who displays idiocy or lack of ability to think? Any word we use could easily be seen as a jab at disabled people. I also think her outrage would sound more sincere if she had not called Obama a terrorist and socialist (both purposely chosen to mislead and cause outrage) while campaigning for VP. Name-callers don't have the right to tell others what not to say.